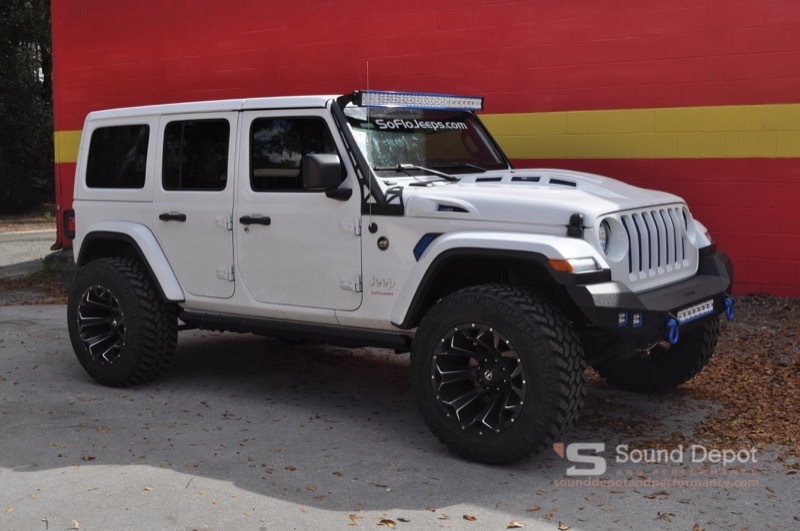 A long-time client from Ocala recently contacted the team at Sound Depot and Performance for some help in fixing and upgrading the accessories installed on his new 2018 Jeep Wrangler Unlimited. He had purchased the Jeep from a dealership in South Florida that specializes in off-road conversions that include lift kits, wheel and tire packages and lighting upgrades. The lights they installed on the Jeep were having problems, and the client wanted us to replace them and add a set of motorized side steps. A 50″ curved light bar was added to the top of the roof. The front bumper opening was the perfect location for a 20″ light bar. Interior lights were added for additional effect. Each wheel well got rock lights. Our team took a look at the lighting installed on the truck, then ordered replacement LED light bars from Rough Country. We also ordered a light mounting bracket from DV8 Offroad. The LBJL-01 light brackets are laser-cut, stamped steel brackets that fit around the side of the windshield and allow us to install a 50-inch LED light bar. The heavy-duty bracket features a textured powder-coat finish and mounts to the vehicle using existing hardware. Our team installed the brackets and added a Rough Country 76250 50-inch curved LED light bar. This dual-row light bar features 95 high-efficiency CREE LEDs for a total of 25,650 lumens of light output. The light bar is configured in an eight-degree spot pattern in the center for long-range visibility with a 90-degree flood pattern on the sides to light up the sides of the road or a trail. We added a 20-inch Rough Country 76920 light bar to the front bumper of the Jeep to light the area immediately in front of the vehicle. The client had us paint the accent pieces on the new light bars to match the existing lighting, grille and D-rings on the truck. The last step was to rewire the rock lights in the fenders of the Jeep to function with a dedicated switch rather than being powered by the ignition switch. The client now has full control over all the lighting added to the vehicle. When lowered, the AMP Research steps allow for easy entry and exit. When the doors close the steps retract. We added a set of Amp Research 75132-01A PowerStep electric running boards to the sides of the Jeep. These steps feature heavy-duty weather-resistant motors that extend the step as soon as any of the doors on the Jeep open. The steps retract automatically a few seconds after the last door is closed to provide maximum ground clearance and optimized vehicle aerodynamics. The client was thrilled with the repairs we made to his Jeep’s lighting system, and the PowerSteps made getting in and out of the vehicle much easier. If you are in the market for Jeep accessories, drop by Sound Depot and Performance in Gainesville and talk to our team. You can also reach us by e-mail using our contact page.